Thank you for submitting a review on your experience with 50 Floor. We provide to all customers an expectation of a two hour window to begin installation. However, when scheduling flooring installations, unforeseen circumstances may affect our normal daily operations. Please accept our apologies for this occurrence. 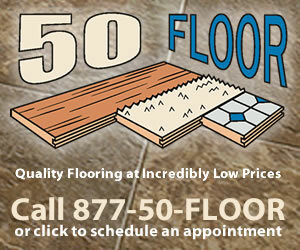 Thank you again for choosing 50 Floor to complete your flooring project. Should you have any questions or concerns, you are welcome to give me a call directly. We scheduled an installation for 8:00-10:00 morning window. The schedular stated that was the earliest to book a time. On the day of installation, we were contacted that due to rain/traffic it would be closer to 9:30-10:30 window frame for the installers to show up. By 12:00 we called 50 Floors to find out what was going on. They replied that the installer would call us back. Jose called and said he would be here at 1:00 when he finishes his other job. So our 8:00 first job of the day start window has been pushed off to 1:00 at the soonest due to another job. Review #940147 is a subjective opinion of User940147.